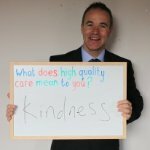 I started this blog when I was Chief Executive of Leeds Community Healthcare NHS Trust between 2011 and 2014. I am now Chief Executive of South West Yorkshire NHS Foundation Trust, having been the CEO of the NHS Confederation between 2014 and 2016.I also lead on the West Yorkshire Sustainability and Transformation Plan. This site has the occasional post from a personal perspective. Enjoy! I have worked in healthcare since 1990, taking on national leadership roles in the Department of Health on policy, transformation and delivery. I was a director in the Prime Minister’s Delivery Unit in the Cabinet Office and in a successful national public/private partnership. I previously spent ten years as a trustee of Leeds Mencap. I have been a successful Chief Executive in the NHS, as a commissioner and a provider of services. I have chaired formal Cancer, Primary Care and Learning Disability Networks. As a front line Chief, I often worked on many national projects and continue to do so. I am passionate about the NHS, health and care. I am determined that we thrive in the tough times ahead through the talent that exists in our staff, partners, parents, carers and patients. I firmly believe this means we have to live our values in tough times. I recently gained formal qualifications as a Coach . I am fortunate to be a Visiting Professor at Leeds Beckett University. I am proud to be an honorary Fellow at the Queen’s Nursing Institute and Royal College of GPs, as well as a Fellow of the Royal Society for the encouragement of Arts, Manufactures and Commerce. Outside work, I enjoy music, Manchester City, food, literature and being a servant to my two children…. I live in Leeds. Dear Rob, I am a service user with a diagnosis of schizo-affective disorder (for 30 years). My book entitled ‘Loud Silence’ has been published through the Institute of Psychiatry, King’s College London. Professor Graham Thornicroft initiated the publication. Most of the poems have an anti stigma message. I’d like to send you a copy. Please send me a forwarding address. Hi Bill – sounds good. You can reach me at 1st Floor Stockdale House, Victoria Road, Headlingley, LS6 1PF. Good luck with the book. Hi! Rob, I’ll post a copy of ‘Loud Silence’ to you asap. Best wishes, Bill..
Ashley Callaghan (student MH nurse). I would very much like to speak with you regarding my experience of Fieldhead Hospital. Please could I have an email address or telephone number to contact you?